The ASU team's interdisciplinary work, led by Petra Fromme of the Biodesign Institute, may one day help scientists better control blood pressure irregularities with a new class of drugs that could limit harmful side effects. "Uncovering the structure of the angiotensin receptor is a real breakthrough in the development of better drugs to regulate blood pressure," Fromme says. It has been unraveled by a new technique called femtosecond crystallography, pioneered by researchers at ASU and their collaborators. "Many ARBs have been developed, but the interaction between the drug and the receptor has been unknown at the atomic level," said Vadim Cherezov, a chemistry professor at the University of Southern California (USC) who led the experiment in collaboration with nine other institutions at SLAC's Linac Coherent Light Source (LCLS) X-ray laser, a DOE Office of Science User Facility. Solving the structure of the joined ARB and receptor brought researchers a number of surprises. "We have shown that all of the previous molecular models – the best guesses for how receptor and drug fit together – were wrong in many important details," Cherezov said. One third of U.S. adults suffer from high blood pressure or hypertension and take prescription medication to treat it. Known as a "silent killer" because the condition often produces no outward symptoms, hypertension is a major risk factor for heart disease and stroke, the leading causes of death in the U.S.
Crystalized samples are imaged on the scale of femtoseconds. A femtosecond is 0.3 "light micrometers," a timespan so brief that in 1 femtosecond, a light ray would cross a distance barely the size of a virus. The concentrated X-ray beam vaporizes the sample, but the pulse is so short that the delicate structure is captured before the molecule is destroyed. 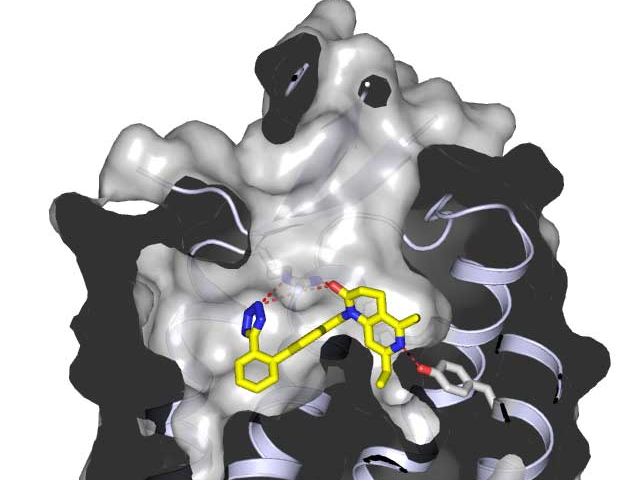 "A further exciting avenue would be to construct a molecular movie of the function of the receptor and the changes induced by the drug binding," said Fromme. "By obtaining a movie of the dynamics of the receptor and the drug binding, we can eventually design structure-based drugs that block the receptor in action, which might be more efficient and specific, thereby minimizing side effects for the patients."